The ISU-152 is well-known for its 152mm BL-10 gun. With its extreme alpha damage, as well as penetration that laughs at the armor of most tier 10 tanks, this is an exceptionally dangerous tank destroyer. The gun, of course, fires at the average rate for 122-152 mm guns at tier 8, has horrific handling (Typically Russian), and takes long to aim. The tank is fairly fast in a straight line, but turns quite slowly, and has flat and weak armor for It’s tier (however, it does have a very thick gun mantlet, so at times you will bounce some shots if lucky enough). It does, however, have a good camouflage rating, making it best for supporting its team from the second line. Oversized mantlet, which helps with the wiggling technique during reloading. Amazing alpha damage and penetration. Above average speed for a TD. Very vulnerable to crew damage, especially the driver. Abysmal traverse speed; can and often will be circled. Poor handling and bad aim time. Ammo rack located in the front. Stock, it comes with the same gun on the SU-152, at a tier higher. The 122mm guns are ineffective since they have only 175mm of penetration (excluding the BL-9S; not required for BL-10) and won't work against tier 9 or 10 enemies. Therefore, it is highly recommended to get both 122mm guns on the SU-152 to shorten the stock grind by 40%. The mighty BL-10 makes you a threat that no tank can safely ignore, but the gun's own temperamental nature can severely limit your performance. Accuracy, penetration, and damage dealt can all fluctuate wildly, and the same gun that nearly 3-shots a Maus one minute can and often will be completely missing TOG’s at 100m, failing to penetrate scout tanks, and dishing out repeated sub-600 damage rolls the very next. Tricky, low-percentage shots are strongly discouraged, unless you have absolutely no other option. This is not to say, however, that the BL-10 is inaccurate. It can, if it chooses to, thread the most impossible shot imaginable with no effort at all if fully aimed. The BL-10 can be best described as 'moody' (or as least as much as a piece of digital code can be) without at any point sounding ironic, and it is entirely possible to have one game where nothing can stand before you, only to have a 10% hit rate the next. Get the BL-10. Must have to make this TD successful. Upgrade the Suspension and Engine. Optionally, you can get the BL-9S. ISU-152 was a Soviet multi-role fully enclosed and armored self-propelled gun developed and used during World War II, with a subsequent use, mainly in the Soviet military, till the 1970s. The ISU-152 marks its beginning on January 24, 1943. This was the moment of appearance of the first fighting vehicle of this family. 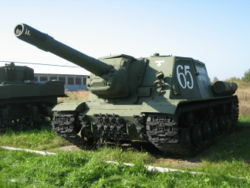 It was designated Object 236 (Объект 236), using the same concept as the ISU-152. The Object 236 was completed in Factory No. 100 in Chelyabinsk, and on the same day, January 24, underwent trials on the Chebarkulski artillery range, 107 km from Chelyabinsk. By February 7, 1943 the trials were over, passed with success. On February 14, the vehicle was adopted and put on production under the KV-14 (КВ-14) designation. In April 1943, KV-14 was ordered to be henceforth designated SU-152 (СУ-152). In time, the combat performance of the SU-152, based on the KV-1S tank, made necessary the modernization of the vehicle, using the new IS tank as a base. On May 25, 1943, shortly after deployment, the administration of Factory No. 100 ordered the beginning of the SU-152 modernization, which included an increase of the armor protection and other improvements. The development began in July 1943, under the supervision of Joseph Yakovlevich Kotin (the chief designer of Soviet heavy tanks) and G. N. Moskvin as the main designer, and in about a month the first modernized variant was ready. It was designated IS-152 (ИС-152). It underwent factory trials in September 1943, revealing a large number of different deficiencies, which sent it back for further improvement. In October 1943, a second (different) modernized variant was ready, designated Object 241 (Объект 241). It was an improvement over the IS-152. The factory trials began the same month, followed by state trials on the Gorohovetskom test range. On November 6, 1943, an order was issued for adoption of this variant, under the ISU-152 (ИСУ-152) designation, and in December its production began at the Chelyabinsk Kirovsk Plant, replacing the SU-152. On April 15, 1942, at the plenum of the artillery committee, it was recommended that the development of assault guns for support of infantry, as well as the necessity of also developing assault guns capable of destroying fortified positions begin. It was intended that these assault platforms be armed with a 152.4 mm gun-howitzer and used for penetration of the enemy defenses in the offensive operations planned for 1942-1943. 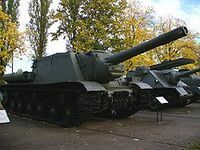 This resulted in the development of the Object 236, and eventually the SU-152, with this concept later continued and further developed with the ISU-152. 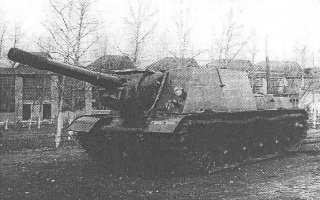 The ISU-152 followed the same design as other Soviet self-propelled guns, except for the SU-76. The fully armored hull was divided into two compartments: fighting compartment for the crew, gun, and ammunition in the front of the hull, and engine and transmission in the rear. The gun was mounted slightly to the right of center with a limited traverse of 12 degrees left and right. The crew consisted of 4 or 5 men placed in the superstructure. Three of the crew were to the left of the gun: driver to the front, then gunner, and last the loader. The vehicle commander and lockman were to the right: commander to the front and the lockman behind. When the crew consisted of 4 men, the loading was carried out by the lockman. The suspension consisted of twelve torsion bars for the six road wheels on either side. The drive sprockets were at the back, and the front idlers were identical to the road wheels. Each track was made up of 90 links. There were three internal fuel tanks, two in the crew area and one in the engine compartment. These were usually supplemented with four unconnected external fuel tanks. Twelve and 24-volt electrical power supplies came from a 1 kW generator feeding four accumulator batteries. For observation from the interior, all roof hatches had periscopes and there were two gun sights : telescopic ST-10 (? ?-10) and panoramic. For crew communication, a TPU-4-BisF intercom was fitted, and for inter-vehicle communication there was a single 10R or 10RK radio. These were better than Soviet equipment at the start of the war, but still inferior to German equipment. The crew were given two PPSh sub-machine guns with 1491 rounds and 20 F-1 grenades for short range self-defense. The ISU-152 was armed with the same gun as the SU-152. It used the hull of the IS-1 tank (later IS-2 or IS-2 model 1944) instead of the KV-1S. Later in the war, the ISU-152 was further improved. It used the hull of the IS-2 or IS-2 model 1944 tank, the armor of the mantlet was increased, the gun was replaced by newer variants, a 12.7 x 108 mm DShK anti-aircraft machine gun was installed by the right forward hatch, and later its ammunition capacity increased, the 10R radio set was upgraded to a 10RK, and the fuel capacity was increased. Some ISU-152s were equipped with even larger external fuel tanks; two tanks on the rear hull deck, in addition to the four external fuel tanks (90 liters each, maximum), or with two smaller additional external fuel tanks, on the hull rear. This option was probably available for the post-war ISU-152 modifications. Between December 1943 and May 1945, 1,885 ISU-152s were built. Mass production ceased in 1947, with 3,242 vehicles produced in total. Post-war ISU-152 modernization included installation of night vision sights, replacing of the V-2IS engine with the V-54K, the 12.7 machine gun was replaced by a newer variant, the ammunition capacity increased to 30 rounds, additional armor, automotive improvements, and a significant increase of the main fuel capacity. The initial variant, developed in 1943. The factory designation was Object 241 (Объект 241). It was armed with the 152.4 mm ML-20S (МЛ-20С) gun-howitzer, with a barrel length of over 4.2 meters (27.9 calibers). The self-propelled gun carried 21 rounds of two piece (shell and charge) armor-piercing and high explosive ammunition. The gun had a maximum range of 6,200 meters. The armor-piercing round, weighing 48.78 kg, had a muzzle velocity of 600 m/s and a maximum penetration of 125 mm of RHA at 90° at a range of 500 meters. The ISU-152 had different modifications concerning the gun (newer modifications), the number of the hatches, or the hull, based on the IS-1, IS-2, or IS-2 model 1944. The latter modification had a thicker gun shield, fuel tankage with increased volume, etc. Till May 1944, the main armament was the 152.4 mm ML-20 model 1937 gun-howizer. The ISU-152 had a rate of fire of 2-3 rounds/min. 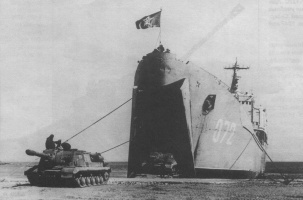 The early modifications had three hatches at the superstructure roof and one emergency hatch at the bottom of the hull behind the driver's seat, which had an armored cover. Later was added a fourth round hatch, at the superstructure roof on the right, next to the rectangular hatch on the left. The later ISU-152 modifications, with newer gun and slightly longer barrel, up to over 4.9 meters (32.3 calibers), had a maximum range of fire of up to 13,000 meters. One prototype, developed in 1944. In April, 1944, in an attempt to increase the firepower of the ISU-152, a high-power variant of the self-propelled gun was developed, designated ISU-152BM (ИСУ-152БМ) (ISU-152BM), sometimes referred to as ISU-152BM-1 or ISU-152-1. The "BM" ("БМ") in the designation stands for "Большой Мощности"/"Large Power". The main purpose of the ISU-152BM was to fight against heavily-armored tank destroyers such as the Elefant and the Jagdtiger. 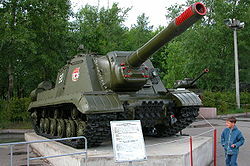 It was armed with the 152.4 mm BL-8 (БЛ-8) long barrel gun, which unlike the ISU-152's gun, wasn't a gun-howitzer. It had a maximum range of 18,500 meters. The self-propelled gun carried 21 rounds of two piece (shell and charge) ammunition. The overall length of the gun was coming up to 8 meters, with a barrel length of about 46 calibers. The armor-piercing round, weighing 48.78 kg, had a muzzle velocity of 850 m/s. The factory designation of the vehicle was Object 246 (Объект 246). It used the engine, transmission, running gear, and electrical equipment of the ISU-122. During the trials, the gun showed unsatisfactory results; being difficult to operate by the crew, unreliable working of the muzzle brake, etc. In addition, the gun, reaching out too far, was limiting the maneuverability of the vehicle. In August, 1944, the BL-8 gun was replaced with the 152.4 mm BL-10 (БЛ-10) long barrel gun, which had the same ballistics, but with differences including a modified muzzle brake and a different breech block, and the self-propelled gun was designated ISU-152-2 (ИСУ-152-2) (ISU-152-2). Its factory designation was Object 247 (Объект 247). The trials were still showing some problems, and though it was sent back for further improvement, the ISU-152-2 was never adopted. Today, this self-propelled gun is located at the Kubinka Tank Museum. One prototype, developed in 1945. It used elements of the IS-2 and IS-3 tanks. The overall height of the vehicle was reduced to 2240 mm, which was compensated by an increased width of the superstructure. The factory designation was Object 704 (Объект 704). It was armed with the 152.4 mm ML-20SM model 1944 (МЛ-20СМ обр. 1944 г.) gun-howitzer, with a barrel length of over 4.5 meters (29.6 calibers) and no muzzle brake, which further increased the firepower of the gun. It had a maximum range of 13,000 meters. The self-propelled gun carried 20 rounds of two piece (shell and charge) armor-piercing and high explosive ammunition. The armor-piercing round, weighing 48.78 kg, had a muzzle velocity of 655 m/s. The rate of fire was 1-2 round/min. ISU-152 model 1945 had four hatches at the superstructure roof and one emergency hatch at the bottom of the hull behind the driver's seat, which had an armored cover. The self-propelled gun carried two external fuel tanks (90 liters each) not connected to the supply system. The secondary armament of the fighting vehicle consisted of two 12.7 x 108 mm DShK machine guns, one anti-aircraft, and the other co-axial. Protection was increased by placing thicker armor at more radical angles. In the area of the gun, where the mantlet combined with the hull-front behind it and the housing of the recoil mechanism, the armor thickness was 320 mm. ISU-152 model 1945 (ИСУ-152 обр. 1945 г.) was the best protected of all experimental or production Soviet self-propelled guns of the Second World War. However, the radical incline of the superstructure walls combined with the increased recoil of the gun, due to the lack of a muzzle brake, significantly complicated the work of the crew, and for this reason mainly wasn't adopted. Today, the self-propelled gun is exhibited at the Kubinka Tank Museum. A modernized variant of the wartime ISU-152 was developed in 1953. It used a new engine, that of the T-54, with a cooling system and a heater. The capacity of the main internal fuel tank was increased to 920 liters, which added 500 km more to the vehicle's range on a road. The ammunition capacity was increased to 30 rounds after the removal of an additional internal fuel tank that was placed in the crew compartment. The gun had a maximum range of 13,000 meters. It received a new commander's cupola and new sights. The factory designation was Object 241K (Объект 241К). The running gear used many elements of the T-10. The mantlet had an additional armor ring protecting the sight. Some of the ISU-152Ks received an additional 15 mm armored plate welded on top of the 60 mm armored plate covering the mantlet above. Also, some received an additional armored plate welded on the upper mantlet front. The modernization was carried out in the [Leningrad Kirov Plant]. The final variant, a modernized former ISU-152, was developed in 1959. The work was now transferred to the Chelyabinsk Kirovsk Plant. This modernization was parallel to the IS-2M program, and the ISU-152M used many elements of the tank. The factory designation was Object 241M (Объект 241М). The innovations included the installation of night vision sights, increased ammunition stowage for the 12.7 mm machine gun (which was replaced by the improved DShKM), and internal automotive improvements. It had the same new commander's cupola and sights as the ISU-152K. It also had the same main internal fuel tank capacity, 920 liters, adding 500 km more to the vehicle's range on a road compared to the ISU-152, and an increased ammunition capacity to 30 rounds due to the removal of an additional internal fuel tank. The gun had a maximum range of 13,000 meters. The ring protecting the sight was present, and the armor of the upper mantlet front was further increased with a thicker additional armored plate. The ISU-152M had the same V-54K engine with a heater, but lacked the cooling system. The ISU-152 self-propelled gun combined three battle roles : heavy assault gun, heavy tank destroyer, and heavy self-propelled artillery. The 152.4 mm gun used a variety of powerful (shell and charge) ammunition. Some of this ammunition had a 43.56 kg high-explosive shell, or a 48.78 kg armor-piercing shell, or the heaviest of all: the 53-G-545 (53-Г-545) long range concrete-piercing ammunition with a 56 kg shell. The ISU-152 was used for infantry and tank support, attacks on fortified positions in a direct-fire role, support on the battlefield in an indirect-fire role, and for fighting against tanks with direct fire. As a heavy assault gun, the ISU-152 was an extremely valuable weapon in urban combat operations such as the assaults on Berlin, Budapest, and Königsberg. The vehicle's excellent armor protection finally provided the 152.4 mm platform with good protection from most German anti-tank guns, allowing it to advance into the face of direct anti-tank fire, while the huge low velocity high-explosive rounds were excellent at blasting open even the most heavily fortified and reinforced enemy strongpoints. Such actions would be much more dangerous and much less effective for a conventional towed artillery piece, with their high crew exposure and low mobility, or even a tank, with their smaller main guns. When supporting tanks, the usual tactics of the ISU-152 was to be used in the second line of the attack order, 100 to 200 meters behind the attacking tanks, which were usually IS tanks with equal mobility. The ISU-152, like the earlier SU-152 and contemporary ISU-122, was employed by Independent Heavy Self-propelled Artillery Regiments. Between May 1943 and 1945, 53 of these regiments were formed. Many of them were re-formed tank regiments, and employed similar direct fire tactics as used by tanks when supporting infantry. Each of the heavy regiment had 21 guns, divided into 4 artillery batteries of 5 vehicles and the commander's vehicle. For support, the heavy regiments had some supplementary unarmored vehicles such as trucks, jeeps, or motorcycles. In December 1944, Guards Heavy Self-propelled Artillery Brigades were formed, to provide heavy fire support to the tank armies. They were organized along the model of tank brigades, each with 65 ISU-152 or ISU-122 self-propelled guns. 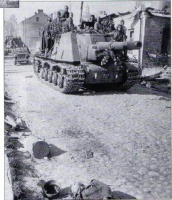 To minimize the risks of being knocked out by Panzerfaust-equipped units during urban operations, the ISU-152 usually acted in one or two vehicle detachments alongside infantry squads for protection. The infantry squad would include a specialist sniper (or at least a sharpshooter), some submachine gunners, and sometimes a flamethrower. The ISU-152's heavy caliber DShK machinegun was also useful for targeting Panzerfaust gunners hiding on upper floors of city buildings or behind protective cover, barricades, etc. 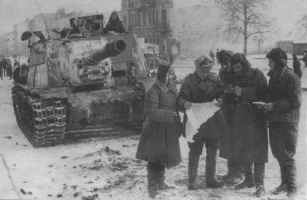 Effective teamwork between the ISU-152 crew and supporting infantry allowed them to achieve their goals with minimal losses, but if such tactics were not adhered to, the attacking vehicles were easily attacked and destroyed, usually through the weaker armor on the roof or rear compartment. 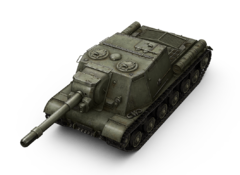 The ISU-152 could also operate as an effective heavy tank destroyer. Though it was not designed for the role, the vehicle inherited the nickname Zveroboy ("beast killer") from its predecessor, the SU-152, for its rare ability to reliably kill the best protected German fighting vehicles, ie; the Panther tank, the Tiger and Tiger B tanks, and even the Elefant and Jagdtiger tank destroyers. The weight of the 152.4 mm shells made for an extremely-low rate of fire, only one to three rounds per minute, and they were not as accurate at long range as high-velocity antitank guns. But, the massive high-explosive shell was capable of blowing the turret completely off a Tiger from sheer blast force alone. No tank crew could expect to survive a direct impact from the 152.4 mm shell, though the chassis itself was sometimes salvageable. If a tank survived, there was enough internal damage to the tank or the crew; splintering of the internal armor or leakage from the damaged tank's pipes and systems. For anti-tank operations following the Battle of Kursk, an even larger armor-piercing ammunition was developed, with an eye towards giving the howitzer a more traditional anti-tank capability. However, these rounds were expensive, in short supply, and only moderately more effective than the standard non-penetrating high-explosive round. As a howitzer, the ML-20S exchanged velocity and accuracy for throw weight and distance, and was not intended to compete with true anti-tank guns. At times, the concrete-piercing ammunition was used for the anti-tank role. A primitive shaped charge ammunition, with a 27.44 kg shell, was also developed. It had a maximum penetration of 250 mm of RHA at 90°, but it was not used during the war. The ISU-152's 90 mm of sloped frontal armor, in contrast to the SU-152's 65 mm, provided excellent frontal protection from the 75mm KwK 40 gun of the ubiquitous Panzer IV and StuG family at all but the closest ranges, while also forcing the Tiger, with its vaunted 88mm KwK 36 gun, to close to medium ranges in order to successfully penetrate the vehicle. This negated the Tiger's traditional long range superiority and exposed more of its vulnerable flanks to the 85mm ZiS-S gun of the Soviet T-34-85. The ISU-152 was not a true purpose-built tank destroyer. It had a very low rate of fire compared with specialized tank destroyers such as the German Jagdpanther or the Soviet SU-100, which could manage a brief burst of 5-8 rounds per minute. However, prior to the introduction of the SU-100, it was the only Soviet armored vehicle capable of tackling the German heavy tanks with any kind of reliability, and its ability to satisfy multiple roles meant it was produced in far greater numbers than the SU-100. Attention to camouflage, quick relocation between firing positions, and massed ambushes of 4-5 vehicles firing in salvo at a single target's flanks reduced the disadvantage of the low rate of fire. Using these tactics, the ISU-152 became greatly feared by German heavy tank commanders, robbing them of their prior sense of invulnerability to Soviet guns and forcing them to commit their forces more cautiously and sparingly. The ISU-152 was sometimes used as a self-propelled artillery for support on the battlefield and preparatory bombardments, though it had a medium range of fire and a slow reloading speed. The Soviet army had not developed specialized vehicles for this purpose. Their tank and mechanized units were well equipped with towed artillery, but the towed guns were very vulnerable while moving and could not support tanks and motorized infantry during rapid advances into enemy positions, especially when they lacked the armored fully-enclosed design of fighting vehicles like the ISU-152. Despite the ISU-152's good features, it suffered in some other areas. The greatest disadvantage was that internal stowage was limited to only 20 or 21 rounds of ammunition, with extra rounds often stowed on the rear deck. Replenishing the vehicle's ammunition supply took over 40 minutes and required a very strong loader, due to the large size and weight of the shells. The ST-10 telescopic sight used for direct fire was graduated up to 900 meters. A second "panoramic" sight was used for direct-fire up to the 3,500 meter range. However, it was problematic for the gunner to switch between the two visors. To compensate, it was simpler to concentrate the fire of several vehicles onto the target, sacrificing accuracy for sheer volume of firepower. The high-explosive shells were large enough to take out even a heavily armored vehicle, or a fortification with the even heavier long range concrete-piercing shells. The usual complement of ammunition was 13 high-explosive and 7 armor-piercing or concrete-piercing. The armor penetration can vary with the different ammunition batches or the different RHA. The use of ISU-152 in the post-World War II years was mainly as an assault gun. By the late 1950s, the Soviets had already developed 152.4 mm nuclear rounds, capable of being used by the ISU-152 in the role of self-propelled artillery, but the low angle of inclination and short maximum range of the gun made it dangerous for the fighting vehicles themselves. The Soviets tried to solve this problem by developing rocket assisted projectiles, but this solution was later abandoned in favor of the SO-152 (? ?-152) self-propelled artillery of a new type, developed in 1968. After the adoption of SO-152, the last remaining role of the ISU-152, as a conventional or nuclear self-propelled artillery, was over. In June 1944, during the Continuation War, a captured ISU-152 was used by the Finnish military. It was lost in the fighting. Another one was repaired in Varkaus, Finland, but never saw action. It was used as a towing vehicle with the gun removed until 1964. 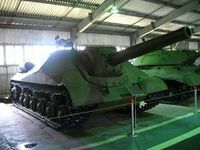 Later, the gun was re-installed and the ISU-152 was added to the collection of Parola Tank Museum. 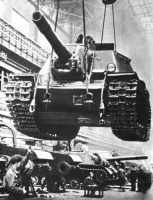 In 1944, over 30 ISU-152s were delivered to the People's Army of Poland. 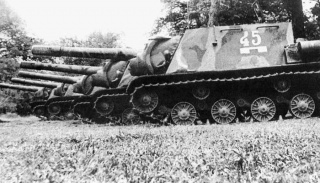 Shortly after, the Poles formed the 25th Polish self-propelled artillery regiment, consisting of 10 ISU-152s and 22 ISU-122s. As part of the 1st Polish tank corps (T-34 and T-34-85 tanks), the regiment took part in the fighting on the river Nysa, southwest of Poland in March 1945. In early 1945, the Polish command began to form another ISU-152 regiment, but with not enough of these fighting vehices. The newly formed 13th Polish self-propelled artillery regiment received two ISU-152 and two SU-85 artillery batteries. This regiment took part in the Battle of Berlin in April - May 1945. During the post-war period, the ISU-152s remained in the Polish military till the early 1960s. In 1955, the Soviet armed forces retreated from Dalian, ending 10 years of residence. All armament was sold to the China People's Liberation Army, including 67 ISU-152s, of which 45 ISU-152s were given to the new founding 1st Mechnical Division of PLA. As part of military assistance to friendly countries, a few ISU-152s were transferred to the Czechoslovakian military after World War II, where they were used till the late 1950s. During the Korean War, ISU-152s were used by the North Korean military. In the early 1960s, the Egyptian military received at least one regiment of ISU-152s. They were used during the 1967-1973 Egyptian–Israeli Wars. Today, whats left to remind us of the ISU-152 can be seen, exhibited, or simply located, at different museums and memorials around the world, or even as a monument, a remnant of a restless past sealed in time. This page was last modified on 19 October 2017, at 23:34.